Hayabusa bullet trains began running Saturday at a new top speed of 320 kph on the Tohoku Shinkansen Line in Japan, equalling France’s TGV as the world’s fastest train in operation. 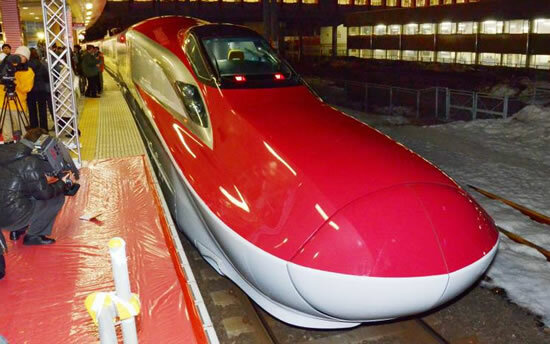 The E5 series Hayabusa, which links Tokyo with Aomori Prefecture on the northern tip of Honshu, now reaches speeds of 320 kph between Utsunomiya and Morioka — the capitals of Tochigi and Iwate prefectures. The Hayabusa’s previous maximum speed — 300 kph — was eclipsed Saturday as operator East Japan Railway Co. revised its service schedules. The bullet trains now cover the 714-km distance between Tokyo and Shin-Aomori stations in two hours and 59 minutes — 11 minutes faster than before.